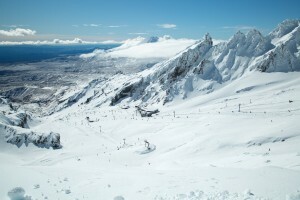 Since 2015 we have been trying to get on Whakapapa ski field so many times, so I tired to count for how many attempts we failed. 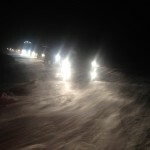 Almost every our try to get there ended up with unexpected blizzard, stormy weather and lifts put on hold. Or even worse, a black ice on the road which you can notice only when you get on the upper car park, stop and put your handbrake on just to realise it doesn’t work and hence the car slides down for a little bit 😮 One time I even got a skid, when we were coming down. I’ve never seen so many warning indicators on my dashboard before – ABS, EPS, WTF 😀 That time I was driving my Subaru Forester, full of people, so it was heavier than usual. Also, the electronics did an incredible job and the car stabilized. 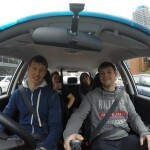 Which I can’t say for my friend, who was driving his Subaru Legacy alone behind us – he was spinning around the road. 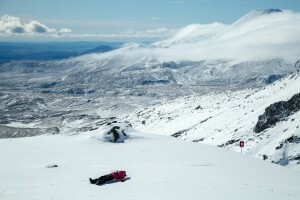 Don’t need to mention, we even started saying, that Whakapapa probably means ‘bummer’. Our great mood sponsor for today is Kiss On My List – Daryl Hall And John Oates. After we failed to start snowboard season in July, we decided to take a break, get calm and wait for a better weather conditions. Also, we agreed to make our decisions based on the weather forecast, always and only. 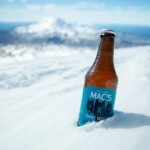 If a weather forecast is good we’ll try to get a day off if possible and go instead of waiting for the weekend. 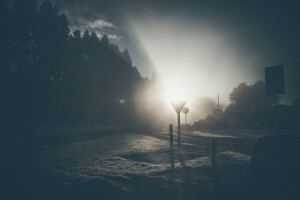 Surprisingly, we didn’t wait for a long time – next week we were on the night road again. One day I’ll post a full set of pictures, made by my crazy friend while I was driving, but not today. I have to say, despite most of these pictures were being made from a moving car, some of them are quite good. 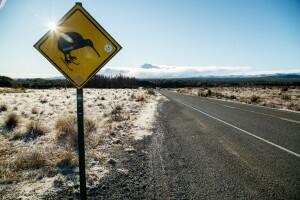 After 4 hours driving we have arrived at Tongariro National Park. 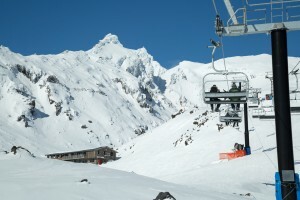 The building on the left is Tongariro chateau. 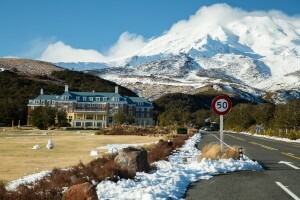 One of the oldest New Zealand hotels. 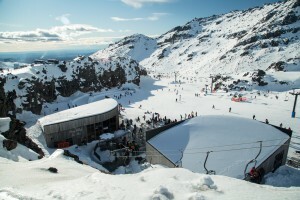 A resort, situated at the base of Mount Ruapehu, nearby Whakapapa ski field. It was built in 1929 and still preserves it’s original style of Great Depression, despite the massive reconstruction it had some time ago. Very beautiful building, which you can’t expect to see in such a remote place. 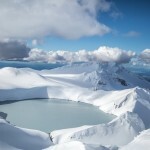 Everyone, who sees chateau Tongariro for the first time, literally loses its jaw and says Wow! We were driving up and made 800 meters of vertical elevation after just 10 minutes of driving. Lorenz’s Bar And Cafe, gear rentals and also the latest Subaru models. 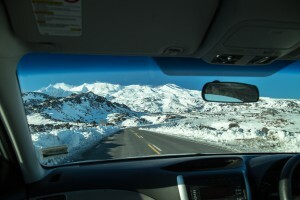 Subaru is an official vehicle of Mount Ruapehu. 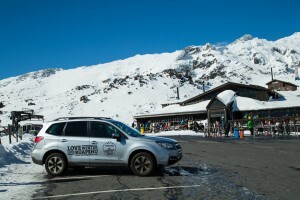 Once a year, Subaru, altogether with RAL holds a special event at Turoa, dedicating upper car park for Subaru vehicles only, giving its drivers and passengers free coffee, free chocolate and other gifts and perks! You can see old three seats lift behind rentals building, which was replaced by a new four-seat lift in 2016. 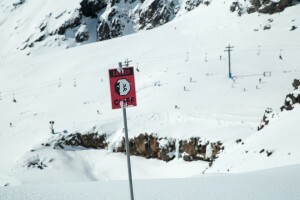 Happy valley – is a special zone for beginners. Since the last year, they have redeveloped the area a lot. 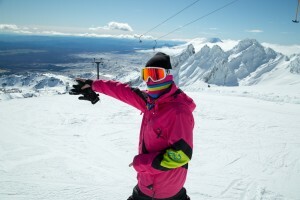 First of all, the size of the area was increased, which makes it very convenient compared with Alpine Meadow at Turoa ski field. Secondly, another magic carpet was built. And third, now you can use a spacious vertical lift to get there. Don’t be confused by the old lift on this picture I made before the renovation. Going up! 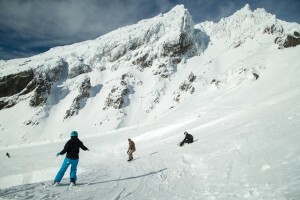 There are very huge and deep gorges at Whakapapa, a way larger than at Turoa. Almost every pilon has information sign, warning you about the danger of lahar, what to do and where to escape. Spoiler: pretty much nowhere. 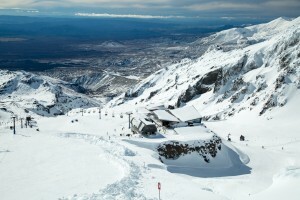 The thing is, every 10-20 years, Whakapapa has a devastating lahars, flowing through (surprise!) 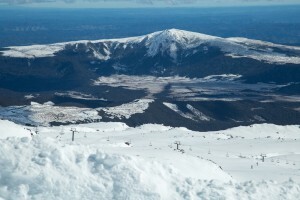 some of the skiing tracks. For example, in 1995, lahar nearly missed lower part of far west lift. 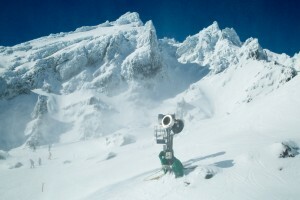 There are snow making machines almost everywhere. 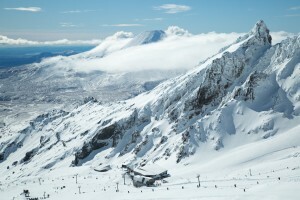 The reason is simple – every winter, base amount of snow at Whakapapa and Turoa is just around 200cm. 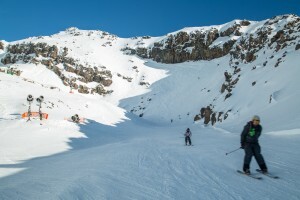 Centennial chair lift zone is a beginner area, so we take another lift, Waterfall express chair to get to the altitude of almost 2000 meters above sea level. Now, I have to say a few words about the Knoll Ridge cafe. 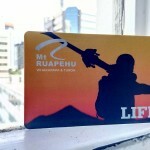 First of all, it is the highest cafe in New Zealand! Secondly, it has an amazing view! 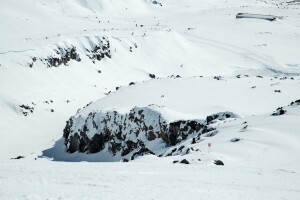 So you can observe surrounding rocks and a ski field. 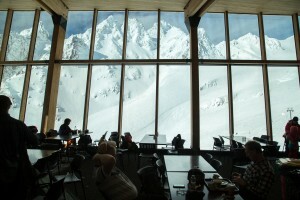 Thirdly, kitchen’s menu has a variety of meals, which is quite uncommon for mountain cafes. Usually, as higher you climb, you get the worse and more expensive food. It’s very nice to find an exception sometimes. 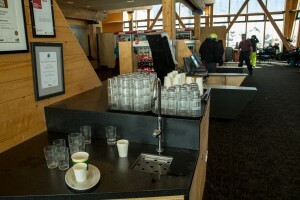 In the last, there are plenty of cups and water so every skier or snowboarder can quench a thirst. Going up higher and higher! This time, we had to use T-bar. 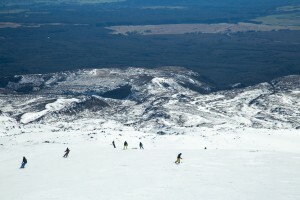 Now I understand, why Whakapapa is less popular, then Turoa. Personally, I think T-bar is quite inconvenient, also it is quite hard to stay on the track using T-bar, especially when it is icy. I don’t count for the situation when you fall right on the start 🙂 Or you were hit by another skier crossing your way, which sometime happens. Also, it makes you tired. Anyway, it’s good to have at least something than nothing. 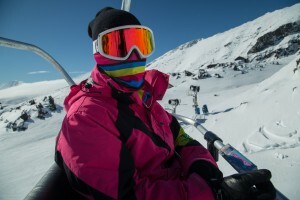 Hopefully, all T-bars will be replaced by chair lifts at some point. 2200 meters above sea level. 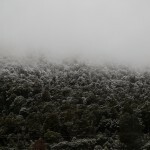 You can see car park, Tongariro chateau and part of National Park behind the area covered by snow. After two-three minutes we had crossed the main lahar zone and had moved further towards West chair lift. To be honest, I don’t really like flat tracks, especially those tracks where you need to speed up in order to get on top of a small hill at the end. 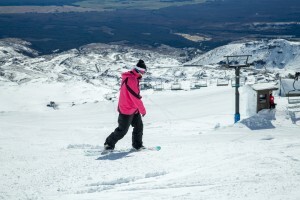 This is the only drawback of Whakapapa ski field for me, as a snowboarder. It doesn’t matter, how fast you are, at some point you have to walk on your feet in order to climb up on a hill. 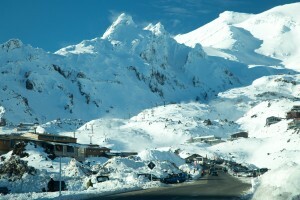 Whakapapa has something you remember for a long time. I mean, the landscapes are very unique. To me, they look different to any New Zealand places I’ve been before. 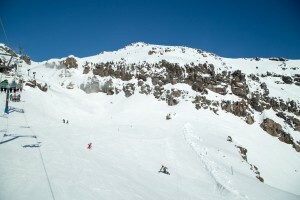 Finally, we got to the West Ridge Chair, the most western part of the ski field. 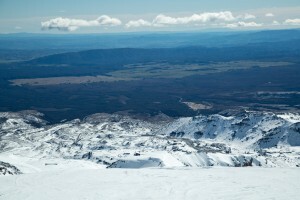 Now, I will tell you why I love northern part of Ruapehu mountain so much, compared with southern one. 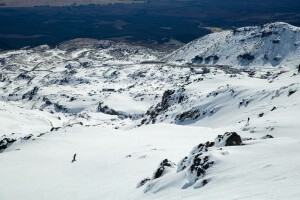 And also, why I have recently started visiting Whakapapa ski field more often, instead of Turoa. 2. 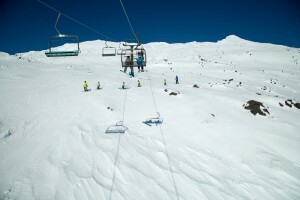 I think Whakapapa is less crowded. 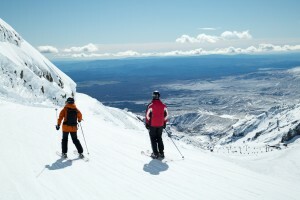 Some say, skiers prefer Turoa, while snowboarders love Whakapapa. Others say completely different! Anyway, so many people, so many opinions! 4. 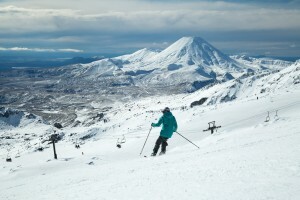 Whakapapa is based 40 minutes closer to Auckland. 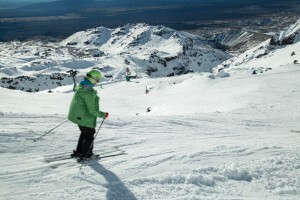 So for me, if we are talking about skiing, compared with skiing and sitting in front of a fireplace somewhere at Ohakune village at the evening, I would go for just skiing. It was getting dark so we had to ski back to the main track. Despite common sense, we decided to come back through the gorge and other fissures, marked by a special signs. Next 5-10 meters I was sliding down the hill trying not to loose my snowboard and not to fall down from a 30 meters height. I think I stopped just by a true miracle. 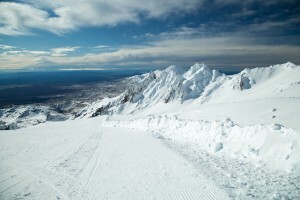 Then I had to climb up to avoid icy hill, using my snowboard to lean on and jumping forward as a frog. As result, I have dislocated some of my upper back vertebrae, having an incredible pain later in the motel. I was falling a sleep, waking up again after 15 minutes, trying to turn on another side in order to find a less painful position and so on. During all this time, my ski buddy was walking in the room, keep saying: shall we call an ambulance? Shall we call an ambulance? -Wake up buddy! No reason for calling an ambulance! 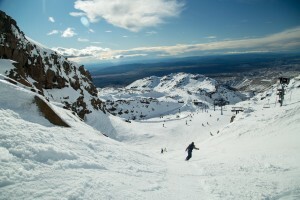 I am ready for snowboarding again! -A HUNDRED per cent sure! LETS GO! In conclusion – I’ll show you a few more pictures. 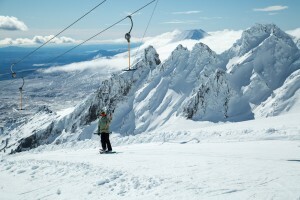 Whakapapa is forever. Stay tuned!